Resume trends change over time. These broad and industry-specific shifts reflect developments in employer expectations regarding resume content and the way these documents should look. One of the best ways to make sure you meet hiring managers’ requirements for a complete, organized, and well-designed resume is to choose a layout that has worked for recent jobseekers. Our collection of top resume templates makes it easy to compare the designs that are currently most popular. You may find that certain layouts are better suited for your field of work or level of experience. There is no need to worry about your resume resembling the materials submitted by other applicants, as many jobseekers take a more traditional approach to resume writing rather than selecting a fresh template. A cutting-edge design can help you present yourself as a candidate who has a finger on the pulse of the job market. Why Use Top Resume Templates? Our collection of top resume templates includes several different resume styles. Let’s explore different types of designs that you might want to consider. If you are a new jobseeker or applying for jobs in a new field, you can use our selection of popular entry-level resume templates to make sure you are on the right track. These templates can help jobseekers who do not have much relevant work experience to find ways to present themselves as qualified and capable applicants. Professionals with extensive experience and a wide range of skills can also benefit from using a resume template. Templates allow you to choose the style of resume you prefer and focus primarily on the substance you want to present. The top resume templates for professionals range from chronological or combination formats to portfolios, depending on your field. Some of our most classic designs are also top resume templates. If you are looking for a template that will make it easier to present all of the necessary information, you might want to use one of these layouts. Classic templates offer a range of stylistic options. They are not likely to surprise anyone, but they are also practically guaranteed to satisfy in terms of appearance and organization. If you are looking for something a little newer, you could start with our selection of contemporary resume templates. These templates offer an updated take on classic or traditional layouts. 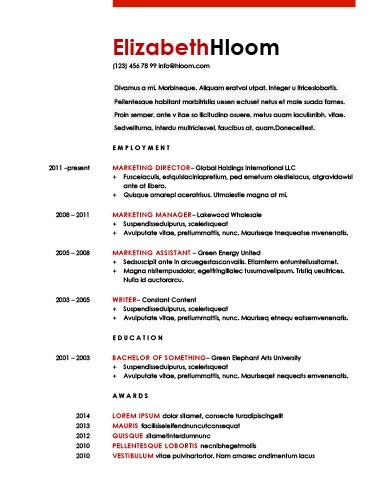 A contemporary resume layout suggests your awareness of design trends and stylistic principles, which can be beneficial in some fields. The top resume templates in this category are eye-catching and well-designed. If you want to make sure that hiring managers are receptive to the design and structure of your resume, you should consider using one of our tried-and-true resume designs. Jobseekers and employers appreciate the top resume templates in this category because these designs elegantly and efficiently incorporate all of the necessary components of a complete resume. Most resume templates feature the five major resume sections listed below. Employers generally expect to be able to find out about the following parts of your background from reading your resume. Name: Give your full name in case employers generate an application record based on your resume. Location: At the very least, you should provide your current city and state of residence. You may also wish to include a mailing or street address. Phone: Choose a personal cell or home number rather than your current or past work number. Email: Use a professional email that you check regularly. Social Media: Add usernames or links to professional social media profiles if desired. Summary Statement: If you would like to sum up your major qualifications at the top of your resume, you should consider writing a summary statement. This section allows you to quickly indicate the amount of experience and relevant skills you bring to the table. Objective Statement: Entry-level applicants, recent graduates, and those who have recently changed careers may benefit more from an objective statement. This approach to starting a resume focuses on setting forth your primary professional goal. Identify: Read over the job description to identify important skills and specific keywords. Select: Choose skills or keywords that accurately reflect your abilities. Think of any other skills that might help to indicate your qualifications for the position you are seeking. Order: Prioritize the most important skills based on the job description. Structure: Most of the top resume templates organize the work experience and education sections in reverse chronological order. Your present employment or most recent credentials come first followed by preceding positions going backward in time. Basics: Start each entry with a job title, employer name and location, and dates of employment. Details: Describe your responsibilities and achievements in each position. Use metrics to quantify your experience or success where possible. Degrees: List any relevant degrees starting with your highest or most recent degree and going backward to earlier degrees. If a position requires an associate’s or bachelor’s degree, there is no need to bring up your high school diploma. Training: You may also want to cover occupational training, certificates, memberships, or professional licenses in this section.